Thinking about going abroad to gain a TEFL and teach? Check out this guide to how to maximise your impact in the classroom. What makes a good TEFL teacher? When you are travelling abroad to teach, students love to learn more about where you come from. Remember to pack photographs of your home. They will be a great way to break the ice and spark their interest. Another valuable item to take is blue tack. It isn’t always easy to buy abroad. Blue tack is great for sticking good pieces of work on the wall. Stickers are also a must for any class. Although they seem more suitable for younger students, it’s is always amazing how motivational they can be for older kids too. The first day with a new class can be daunting, especially if you are new to teaching. As a TEFL teacher, it will be important to understand how other teachers in the school you work out greet their students. The best way to know this is to ask if you can observe a teacher before you start. Avoid diving straight into teaching – get to know them first and let them get to know you. 1) Work out a lesson objective – what do you want the class to know by the time they leave? 2) The hook – how are you going to hook the students interested in the first few minutes of the lesson? Short, thought-provoking activities are the best for this. For example, you could give them a picture relating to the objective and ask them to write down 3 questions they would like to answer by the end of the lesson. 3) Starter – students often need a confidence boost so give them an activity which links to what they learnt last lesson. This will help to consolidate their prior learning, but it will also help to link lessons together. 4) Main – The middle section of the lesson will be where they learn the new concept of idea. For example, if you are working on vocabulary you may be focusing on learning the definitions and practising pronunciation. Try to balance active (student’s working) with passive (student’s listening) activities. 5) The big finale – get the student to practice what they have learnt. If they have learn new vocabulary, you could give them a creative writing task where they have to include the words they have learnt or you could play a game to test their memory. When the lesson is in full swing, make sure you keep checking how the students are getting on. Students can be shy or embarrassed to admit if they are struggling so devise a system where you can check how everyone is getting on. One strategy may be to give them all cards, with symbols or colours on each side, to put on their desk where they can indicate, by turning the card over, that they are struggling. Any class in any part of the world will have hard-working children, shy children and children who are mischievous. No two children are the same and the job of a teacher is to balance the needs of all of the individuals in the class. Positive praise always works well. Praise good behaviour and your students will be keen to work well. Mix up activities so that you have a variety to keep all students engaged. Whatever happens – stay calm! As a TEFL teacher, your main aim is to excite students about the English language. Although spelling and grammar are important, don’t forget to promote a passion for reading and writing. Read them your favourite stories and spark their imagination through games and creative tasks. Just make sure that stories that you read are culturally sensitive and appropriate. 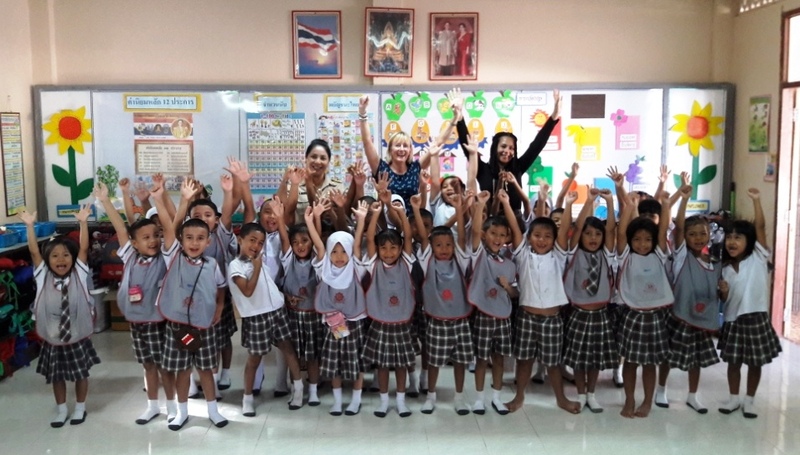 Feeling excited about the prospect of becoming a teacher abroad, check out our TEFL programmes in Thailand and China. You too could gain a TEFL abroad and gain valuable experience in the classroom!